Sprouting broccoli is a perennial. If you cut the heads off carefully, side shoots will form with heads which are smaller but which taste just as good. Your need: One person consumes an average of 2.2 kg a year. Apart from the many conventional varieties of broccoli, there is a perennial variety called purple sprouting broccoli, which is also known as winter broccoli. This is sown in high summer (July in central Europe), overwinters in the open and can be harvested in spring of the following year. Warm position in full sun. Soil must be moist, rich in humus and nutrients, chalky or loamy-sandy. The sprouting broccoli variety can overwinter in the open. Cover with a garden fleece if it's very cold. As a rule, the time to sow depends upon the preferred harvest time. 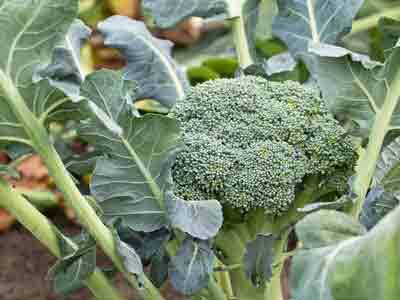 Broccoli requires a lot of nutrient and it tolerates fresh organic fertiliser. It needs a lot of water. Pests: Flea beetles, cabbage root flies, cabbage white butterfly caterpillars and turnip sawflies. Always keep the soil moist and hoe regularly (to prevent/reduce infestation by flea beetles). Space the plants well and leave a gap of at least three years before planting them again in the same bed. When harvesting, pull out the stalks and destroy them. As broccoli does not ripen very evenly and after the harvest small side shoots still manage to blossom, from one planting it is possible to harvest over a period of several weeks. It is possible to harvest purple sprouting broccoli in late autumn and from early to late spring. Broccoli will keep in a fridge from one to seven days. You can freeze broccoli. Before freezing, you should blanch it for about 3 minutes. You can enjoy broccoli both raw and cooked. For a salad, marinate the lukewarm broccoli with an oil & vinegar vinaigrette for about 20 minutes. To cook, cut the rosettes and the pieces and boil. Broccoli contains compounds that lower the risk of some cancers. As these compounds are very soluble in water, short cooking times are recommended. After cooking broccoli, rinse it with cold water to keep its dark green colour. The tender leaves and stalks are edible too. One person consumes an average of 2.2 kg a year. Der Blumen-, Grün-, Rosenkohl und Broccoli Verbrauch lag laut der Bundesanstalt für Landwirtschaft und Ernährung (BLE) für das Jahr 2014 um 2,2 kg pro Kopf/Jahr.